Blackboard and kids concerts: An opportunity to play to an appreciative audience while you perform under the eye of our experienced sound technicians – while using professional sound equipment. Festival Choir: A great opportunity to socialize/harmonise and share your love of singing. All will encourage you to give it a go and participate. Kids Educational and Entertainment Program: Designed to stimulate and educate the young attendees of the festival, jam-packing their time with captivating treats. Run and supervised by professional child educators and entertainers. Children’s Blackboard Concert: The festival children are our next generation of performers. These blackboard concerts provide a concert platform where the children can sing / dance / do instrumentals / tell stories – anything they choose. You are encouraged to encourage your children. 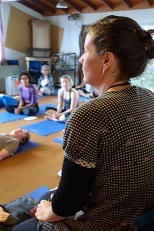 Yoga: Start Saturday and Sunday mornings with Restorative Yoga. Thanks for the feedback received last year this will be scheduled before breakfast and many thanks to Rachel Bayliss for the flexibility in scheduling. Come and stretch your aching bones and start the day feeling good. No experience necessary. Pop-Up UKESTRA: – A conducted community Uke experience with skill differentiated parts, enabling all levels of players to participate with ease. This includes a selected lead singer for each song, soloist and a Uke-bass player to add the structure. Timing and rhythm are key to songs sounding good and each song will start with learning the basic count and embedding the chord sequence under our fingers. An opportunity to learn songs really well, The Pop-Up Ukestra delivers ‘teachable moments’ in the context of the song so you’ll be notching up your skill/theory/memory level as well as having fun & singing. The Pop-Up Ukestra is an immersive uke experience that ends in a public performance without sheet music – suitable for ages 8 -108 who have at least C, F G7 under their fingers! Brought to you with energy and support by Uke Nomad. Waipara Adventure Centre: – will be leading small groups through their rope climbing challenge with fully trained guides. Conditions and additional charges apply. 2) Swimming hole – lets hope the weather is good and the water not too swift. Please supervise ALL children of ALL ages, at ALL times. 3) outward bound course – for parents and older kids alike. Situated at the end of the rugby field. 4) Flying fox – tie those pony tails up …For the older ones only.